Excel ConsultantBlogBlog CategoryShould You Hire A Local or Remote Microsoft Consultant? Should You Hire A Local or Remote Microsoft Excel, Access & Power BI Consultant? Excel Consultant describes the differences between local and remote Microsoft Excel, Access and Power BI consulting, highlighting the many benefits our team of specialists offers. Remote, or local: that is the question. It may not be the original Shakespearean query, but this is the common conundrum companies face when they decide to bring on a software Microsoft Excel, Access and Power BI consultant. Hiring a tech expert can work wonders for your company, helping you maximize your efficiency by enhancing the programs you already work with every day. In this modern age of business, understanding how to leverage the digital tools at your disposal could make or break your company’s success. For many clients, choosing to collaborate with a Microsoft master is the easy part—figuring out just who to work with proves more difficult. You need a Microsoft Excel, Access and Power BI consultant you can trust with a comprehensive knowledge of the applications you use: a veritable Microsoft master. One of the most significant selections you must make in this process is whether to use a local, in-house consultant, or work with a remote specialist. At Excel and Access Consultants, we’re committed to helping our clients through every phase of programming assistance. In the following blog, we provide all the data you need to determine whether or not you should hire a local or remote Microsoft Excel, Access and Power BI consultant. First, it’s important to understand the essential differences between the two types of Microsoft Excel, Access and Power BI consultants. A local expert comes in person to your office to meet with you, work on your company’s computers, code programs, and train your team. A remote Microsoft specialist performs all of the same functions, but from afar. Fortunately, especially in our current “Cloud” era, it’s simple to go over your options, create a consulting plan, program your computers, design customized codes, and even instruct you on how to use your newly improved software online and via phone. “Telecommuting has risen 79 percent between 2005 and 2012, and now makes up 2.6 percent of the American work force, or 3.2 million workers, according to statistics from the American Community Survey,” as reported by the New York Times. Remote work is booming because it allows employees to be more productive, companies to save overhead costs, and clients to enhance their operations more economically and efficiently. “Regular work-at-home…has grown by 115 percent since 2005, nearly 10 times faster than the rest of the workforce,” according to Global Workplace Analytics. 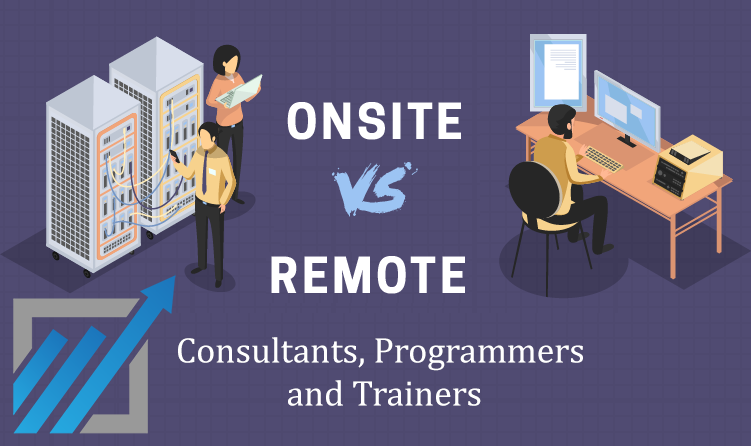 These numbers suggest that remote work is the future of not just technology or consulting, but all types of business operations. In a recent survey reported on by Forbes, “91 percent of remote workers believe they ‘get more work done when working remotely.’” This means that when you hire a remote Microsoft Excel, Access and Power BI consultant, you’ll pay less for more productivity. These are just a few of the notable numbers that help explain why Excel Consultant offers remote services. Jacob, a four-time Microsoft MVP and our USA Lead from California. Jacob has served as the lead developer on many of our most impressive projects, such as those for LinkedIn, Red Bull, and even Microsoft itself. Stan B, another USA Lead based in Los Angeles. He is an Access specialist who has previously lent his skills to major clients such as DIRECTV and the University of Southern California. Paul Delke, Senior Project Manager and Programmer in our Irvine Office (and, given the marvels of modern remote technology, around the globe). Paul is also a part of Talon Computer Associates, one of our frequent collaborating consultancies, which has earned the esteemed title of Microsoft Certified Partner. This means that Talon (with Paul as one of its most important team members) has met Microsoft’s exceedingly high standards for service, skill, and success in its software. Dennis Taylor, one of our Senior Excel Trainers. He calls Denver home but has traveled extensively throughout the United States in Canada providing high-quality, innovative Microsoft instruction. Helen Feddema, a New York City native, prolific author of Microsoft books, and “Sage” level Access coder. 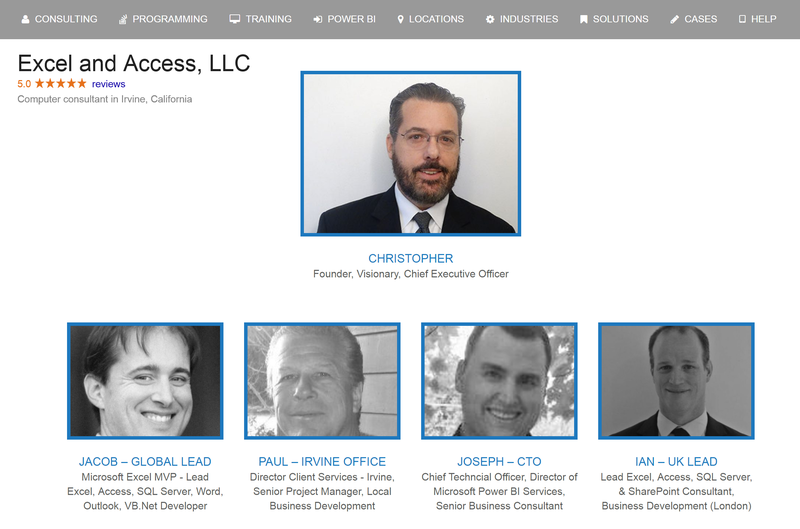 This is just a sampling of our sophisticated team of remote specialists. Fortunately, in this digital age, you don’t have to live in Los Angeles, Irvine, Denver, or New York City to work with any of our Microsoft Excel, Access and Power BI consultants! Instead, you can partner with the programmers, trainers, and advisers that exactly meet your needs. Furthermore, remote options allow these Microsoft maestros to collaborate on your code across state and even national lines, allowing you to enjoy the highest quality service. We serve clients in various locations throughout the United States, Canada, Europe, and Australia. Are You Ready to Go Remote Or Bring Us Onsite? Posted on February 2, 2018 Posted in Blog Category and tagged Paul Delke, Data, Microsoft MVP, Business, Programming.